Reliable and teacher approved online resources purchased by the St. Charles City County Library District available from home, school or anywhere in the world, any time or any day! All you need is your St. Charles City-County Library District Card. If you would like assistance in choosing the best resource for answering your questions or need assistance in navigating the resources, please call the Reference Department of your local library branch. This resource lets you search by plot, series, reading level (Lexile score), character, etc. to locate a fiction or nonfiction book or list of titles you might like to read. Links to St. Charles City-County Library District online catalog. Designed for learners in grades 3 to 6, informs about earth cycles, ecosystems and biomes, rocks, environmental issues, space and more. Specifically designed for learners in grades 3 to 6, topics include animals, endangered and extinct species, food chains, green living, habitats, human body, plants and more. Specifically designed for learners in grades 3 to 6, topics include atoms, molecules, elements and the periodic table, energy and matter, force and motion and temperature and measurement. Search books on drama, biography, literature, United States, countries, science, history & more. Full text articles from magazines, news articles, encyclopedias, books and more. Videos and primary source documents also included. Combines the best of Gale's reference content with age-appropriate videos, newspapers, magazines, primary sources and much more. Search for current or historical biographies for musicians, authors, presidents and more! Click on "Elementary School Skills Improvement" to use diagnostic and practice tests for 4th & 5th grade math and reading. Click on Ebooks: Parent Guides for info on homeschooling, reading, vocabulary, testing, etc. 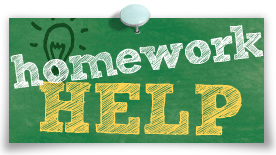 Get help with your homework or practice for tests.